Recently received many email from reader asking me any extra Tuneup Utilities 2008 product key ?I am felt sorry that all the product key already giving out and no more extra key .If you guys needed this kind of the system utility tool,you can try for this free software,Glary Utilities. Glary Utilities includes a variety of system tools that can help you clean your PC from junk files, remove Internet traces, find invalid registry entries, manage startup programs, optimize system memory and more. The program also includes a disk space inspector to locate large folders and files, as well as a Context Menu Manager, that enables you to disabled unused right-click options for files and folders. Other features include and Internet Explorer Assistant, a Privacy Shredder for secure file deletion and an encryption tool. 1.Optimize, clean and boost the speed of your Windows. 2.Protect your privacy and security. 3.Protect your privacy and security. 4. Block spyware, trojans, adware, etc. 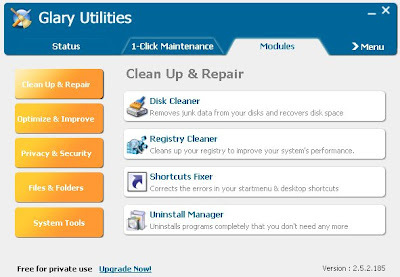 Moreover,it like Tuneup Utilities 2008 with ‘1 click Maintenance features’ to perform the system cleaning and tweaking. This software have two options-Glary Utilities Free and Glary Utilities Pro ( shareware ).As i compared these two options software,found that pro version add in a extra feature only ( Automatic care in background ) .So,download the free version is a better choice. This software supports Window 98/ME/2000/2003/XP/Vista (32 bit) and also available in 15 language. Download Glary Utilities Free and Glary Utilities Pro.